Lead generation isn’t a new concept. It’s a popular and over-used term describing how businesses use aligned marketing and sales strategies to attract new leads. While many companies today have some form of lead gen in place, there are an astounding number of businesses – from small start-ups to large global corporations – that struggle to align sales and marketing teams for meaningful lead gen results. What’s standing in the way? And how can you break through roadblocks if you’ve been aiming to build a strong lead gen function, but are missing the mark? Through my experience talking with CMOs from companies large and small, across diverse product and service industries, it became clear that while the challenges are magnified in larger companies, the basic criteria for lead generation success is always the same. CMOs and business leaders need to adhere to the same set of foundational best practices to drive lead generation success. It sounds trite, but I can’t over-emphasize this enough, which is why it’s #1. Without leadership team buy-in, education, and participation, your lead generation strategy will never get off the ground. You’ll likely need to build a business case to convince key executives to get on board, then you need to turn them into evangelists of your lead gen strategy. And I’m not just talking about your CEO and COO; you need your sales and services/product leaders, and any other revenue-responsible stakeholders, involved from the get-go. Once leadership is on-board and excited about the revenue-driving potential of lead gen, it’s time to introduce change management concepts. After all, you’re going to be asking sales, marketing, and maybe even operations teams to work differently. Change is hard to anticipate until it’s in full swing, but it’s never too early to start educating your internal teams on lead gen, marketing automation, and inbound concepts. 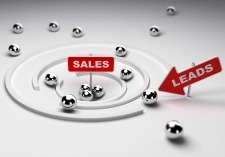 Successful lead generation programs will require a change in processes. So ease teams into it, embrace Agile approaches, and commit to your cause so it has a fighting chance to pay off. Ugh, I know you’re thinking, “Our CRM is a mess.” But guess what? If you’re going to rev up a lead generation program, you need to take a look at your CRM and make sure you have the right data, or at least some data. A clear process foundation should be in place because a messy CRM will cause automation and integration problems. Get creative and come up with enticing ways to encourage sales adoption of the CRM because without that, they won’t have access to all your juicy lead gen data. Remember, the last thing high-energy sales folks want is to sit at the computer and enter data. Our job is to make it easier, faster, and more fun. Go for it! As I’ve said before, “If you don’t like sales, you should get out of marketing.” For your lead generation program to work, marketing must ask for sales’ hand in marriage. That means going to sales meetings, listening to prospect calls, and walking a mile in their shoes to understand and appreciate their world. Then get one or two salespeople in your corner to help talk up early successes, quick wins, and brainstorm new ideas. Keep sales’ attention by hosting happy hours, fun contests, and competitions – and make processes so easy they’re harder not to do. You’re in this together so it’s important that you act like it. Lead generation programs are focused on using technology, analytics, and digital marketing strategies, but that doesn’t mean marketers need to toss their creativity and marketing moxie aside. In fact, I encourage you to hold fast to Peter Drucker-inspired core marketing principles so you don’t lose sight of your primary mission: to attract and convert prospects into customers. It’s easy to get wooed by the bells and whistles of marketing technology, but it’s important to keep your brand and content at the forefront of your efforts so that your lead gen initiatives resonate with prospects. After all, it’s hard to earn consumer loyalty if you don’t engage them effectively. So embrace your inner marketing goddess (or god) and don’t let go! Once you’ve launched your lead generation program, the fun has only just begun! To drive in the best quality leads and ROI, you’ll want to track analytics and conversion rates, monitor your lead scoring, update process flows when necessary, implement sales SLAs, balance inbound and outbound lead generation strategies, and fine-tune your personas. If you neglect to test, iterate, and improve, your lead gen will generate lack-luster results and stagnate quickly. At Celerity, we feel these six lead generation best practices need to be part of your digital product strategy. They have proven to stand the test of time in a world of constantly evolving digital tools and business models. These strategies, when implemented by the right team and resources, ensure a lead gen foundation build on stone, not sand. Have you adhered to these six best practices for your lead generation strategy? Or have I missed ones that have been critical to your success? I’d love to hear from you!